"Yes, he (A.Q. Khan) passed centrifuges - parts and complete. 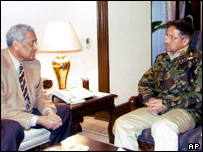 I do not exactly remember the number," President Musharraf told Kyodo. The centrifuges are essential components for enriching uranium, which can be used as fuel for civilian nuclear power reactors or making atomic weapons. But President Musharraf said Dr Khan was not involved in the conversion of uranium into gas or other key steps needed to make the bomb. "He does not know about making the bomb, he does not know about the trigger mechanism, he does not know about the delivery system," Gen Musharraf said. "So if North Korea has made a bomb... Dr AQ Khan's part is only enriching the uranium to weapons grade." Regarding the additional technology, the president said North Korea "must have got it themselves or somewhere else - not from Pakistan". The president's spokesman, Maj Gen Shaukat Sultan, confirmed Gen Musharraf's remarks while downplaying Dr Khan's role in helping North Korea acquire a nuclear bomb. "Saying that someone made a bomb because Khan passed on a couple of centrifuges to them, maybe a dozen of them, this does not mean they can make a bomb," he told Agence France Presse. And we want to supply Pakistan with F16s! How can we be sure that even these will not fall into the hands of the Terrorists, as did the heat seeking Stinger missiles did! A video allegedly recorded in Fallujah played an important role for Turkish investigators: Sakra boasted to an Istanbul magistrate that he'd attended the execution of a kidnapped Turkish truck driver in Iraq. The video shows the death of driver Murat Y�ce in August 2004, at the hands of armed, masked fighters for Zarqawi. Sakra gave a running commentary with a slight smile and no remorse: "Look, now they'll cut off his head. Soon they'll take that pistol off the table, so the blood won't ruin it." And, like a ballistics expert: "Blood wrecks the insides of a pistol." This cold-bloodedness -- mixed with moments of high emotion -- may be related to Sakra's shaky cultural background. He comes from a well-to- do family, but officials who arrested him at an airport in Diyarkbakir found phony papers under the name "Ekrem Oeyer," along with $120,000 in cash, as well as a bottle of psychopharmaceuticals and antidepressants. Officers of the CIA and the Turkish intelligence services (MIT) who took part in this operation thought it was strange that such a hot-tempered mujahid, in custody, could sometimes act so extroverted, while at other times become so apathetic. His statements in the meantime have provoked speculation that Sakra was in contact with several secret-service agencies for years. Turkish media reported that the CIA had contacted him twice in 2000, and tried to tempt him with money, apparently very large sums. Then the CIA lost his trail and turned to the Turkish MIT for help. 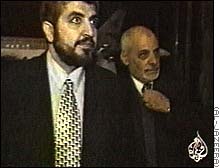 Sakra's attorney, Ilhani Sayan, who believes some of Sakra's statements but not others, claims that in August 2001 -- four weeks before the assaults in America -- the MIT picked up their man, but let him go. Sakra himself says he was arrested twice by the MIT but freed again, both times. In 2003, his wife was also supposedly detained and interrogated for 20 days. Sakra's family lived in Turkey from 1960 on, but then emigrated to Syria, and subsequent financial strain may have been a reason for the fanatical Islamist to cooperate (at least sometimes) with officials. Which proves one thing; that the most murderous and rabid Islamist's loyalty to his cause can be bought out - if you nab him when he needs dough badly and you offer him the right price!